Martin is a doctoral student aligned with the Oxford Rock Breakdown Laboratory. His research interests lie in natural building materials, historic architecture and urban resource management. 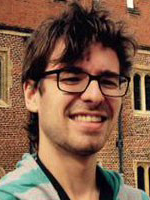 Before starting his DPhil at the School of Geography and the Environment, Martin completed a BSc in Architecture at the University of Bath, a MEng in Architectural Conservation at the Potsdam University of Applied Science, and a MRes in Science and Engineering in Arts, Heritage and Archaeology (SEAHA) at the UCL Bartlett. He also spent a number of years working as a freelance architectural designer and project manager, in which he focussed on retrofitting and renovation. He has helped to organise and tutor architecture student workshops across Europe. Besides his doctoral research, Martin has recently been involved in projects investigating the use of clay barriers to protect historic buildings (with the Fraunhofer Institute for Building Physics) and exploring strategies for sustainable phosphorous management (with the FH Potsdam Institute for Urban Futures). Reigate Stone was used extensively in South-East England between the 11th and 16th centuries, contributing to a legacy of medieval heritage that ranges from parish churches to royal palaces. This project is part of ongoing research being conducted by Historic Royal Palaces into the nature of the stone; assessing how and why condition varies across different locations and developing effective conservation strategies accordingly. The aim is to evaluate the success of previous treatments and propose holistic, preventative strategies. These will be based on an increased understanding of decay mechanisms and make full use of novel techniques and technologies. More broadly, the project will investigate the risks faced by rapidly decaying building stones in urban environments and in the context of contemporary conservation practice. The framework of the research lies in the gradual shift away from invasive treatment towards preventative or 'green' conservation methods, such as soft-capping of walls or the use of creeping plants as a hygrothermal buffer. Close collaboration with heritage management and architectural conservation practice at one of the UKs most important World Heritage sites will enable this project to explore standards for the suitability and feasibility of such methods. This project is undertaken through the EPSRC Centre for Doctoral Training in Science and Engineering for Arts, Heritage, and Archaeology (SEAHA CDT) in collaboration with Historic Royal Palaces and Carden & Godfrey Architects. Michette, M., Lorenz, R. and Ziegert, C. (2017) Clay barriers for protecting historic buildings from ground moisture intrusion. Heritage Science, 5(31): 1-11.